It was a small ryokan* up a quiet side street in Nagasaki. The owner, it seemed, would never quite forgive me for only being one person, but reluctantly showed me to the room. I had left my trainers at reception and changed into the Crocs supplied to walk through the building and now changed from those to the slippers inside the door of the room. There was a separate pair to change into when using the toilet. The hallway led off to a small bathroom and a separate toilet with all the accessories you come to expect in Japan, the heated seat, the hot water jet, the sound effects to spare your embarrassment. 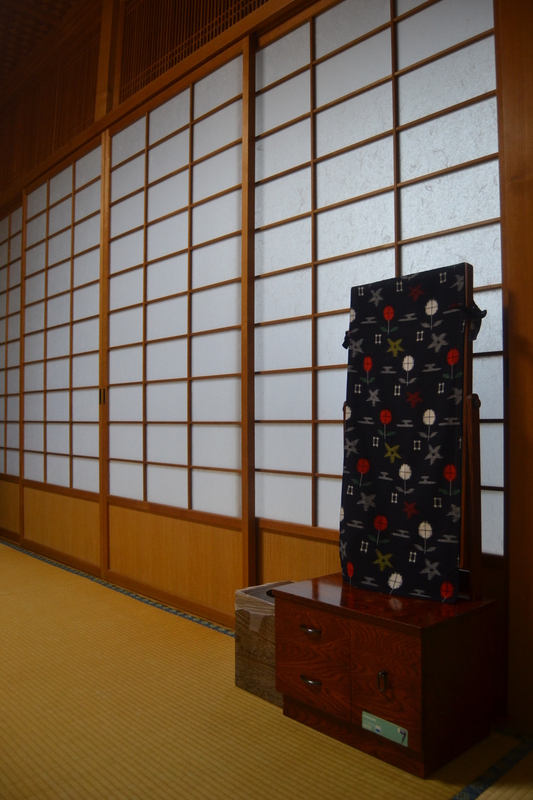 Beyond them, through a sliding screen, was the main tatami-mat room. At the other side of the room, there was a paper screen on a wooden lattice which filtered the light from the windows overlooking the street. Behind it was a narrow room, like an indoor balcony, with polished wood floors, a fridge, a garment rail and space to put luggage out of sight of the main room. 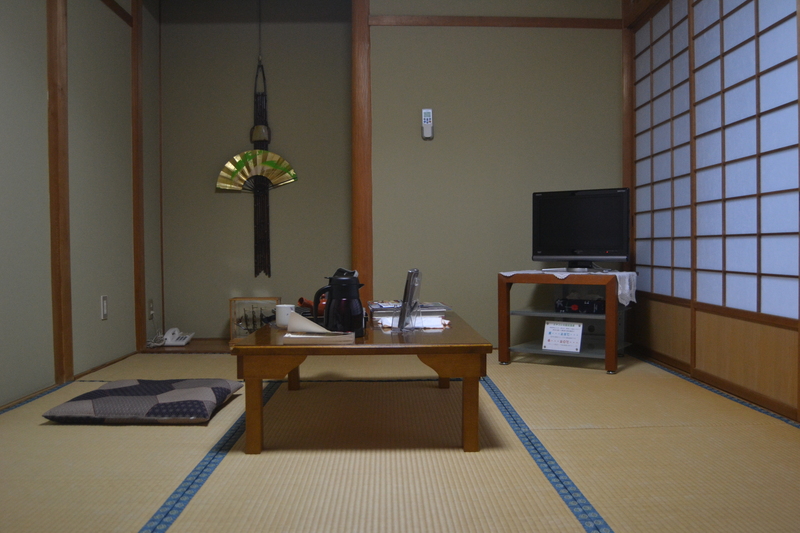 There was a low table and a cushion to kneel on and a kettle, tea pot and cups for green tea, and a neatly folded futon and traditional clothes. The walls were painted a peaceful taupe and were bare except for discrete ornaments in the alcove. Even the mirror attached to a small set of drawers was covered with a drape so as not to disrupt the harmony of the room. “Owner does not say a busybody,” it said in the information pack. A bell sounded as I went downstairs and the owner, who does not say a busybody, came out of his office and supervised me while I laced up my trainers. He was a taciturn, expressionless man and it was unnerving to have him standing there, silently, as if watching to make sure I did not slip behind the desk and steal the petty cash. I suppose it was just his idea of customer service. Another bell sounded when I came back in, and the owner – still not saying a busybody – stood and watched me take my trainers off. He did it every time. He had been in the room while I was out and straightened things up. He must have despaired of my gaijin** untidiness. Clothes strewn about, now perfectly folded; a discarded t-shirt placed on a hanger; scattered books, stacked. A dropped towel replaced with a fresh one. Even an empty carrier bag crisply folded into four. I changed into the yukata, like a long, thin dressing gown with flowing sleeves, tied the obi sash around it and pulled the haori jacket on over the top, then made a cup of green tea, and laid out the futon for the night. Each evening when I came back to the ryokan, the futon had been neatly packed away, the yukata folded, the tea replenished and whatever clutter I had brought into the room tidied behind the screen. When I checked out and got the bill, the prices had all been scored through and replaced in neat manuscript with lower figures. The owner had given me a discount because I was not, in fact, two person.